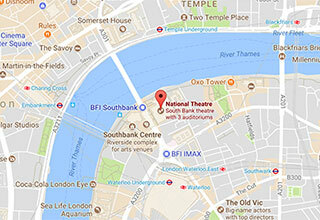 Gift Vouchers can be exchanged for tickets, theatre tours and items sold as part of the National Theatre online ticket buying process. You can have an electronic copy of the voucher emailed to the recipient immediately - just enter their email address in the relevant fields in the form below, personalise the message using the To, From and Message fields, add to basket and complete your payment. The recipient will receive the voucher in an email titled "A National Theatre Gift for you" and we'll also send you an email confirming your purchase. However, if you would prefer to have the voucher emailed to you so that you can print it off and pop it in an envelope or hand it to the recipient, you should enter your own email address in the recipient email address fields in the form below. You can still personalise the message using the To, From and Message fields. You will receive the voucher in an email titled "A National Theatre Gift for you" and you can then print it using a standard A4 printer. We'll also send you a separate email confirming your purchase. You can also choose from one of the two different designs listed below and the voucher can be used for any ticket purchase at the National Theatre. If you want to buy a gift voucher for an amount other than the options in the drop-down, please enter numbers only in the amount field; eg, 45 (for £45 pounds).